Send your wishes via Twitter to @IPTower. 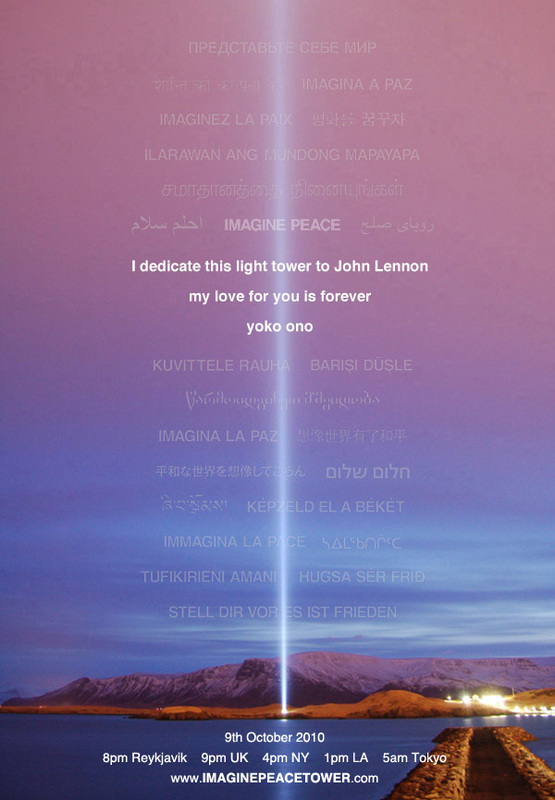 This Saturday, October 9th, I will relight IMAGINE PEACE TOWER in Iceland in memory of my late husband John Lennon. Please ask all your friends to join us by Tweeting your wishes to IMAGINE PEACE TOWER. You can do this by coming to IMAGINEPEACETOWER.com where you can also watch the lighting live with us at 8pm in Reykjavík = 9pm in UK = 4pm in NY= 1pm in LA = 5am in Japan. Let’s Tweet a million wishes for Peace for John’s birthday!